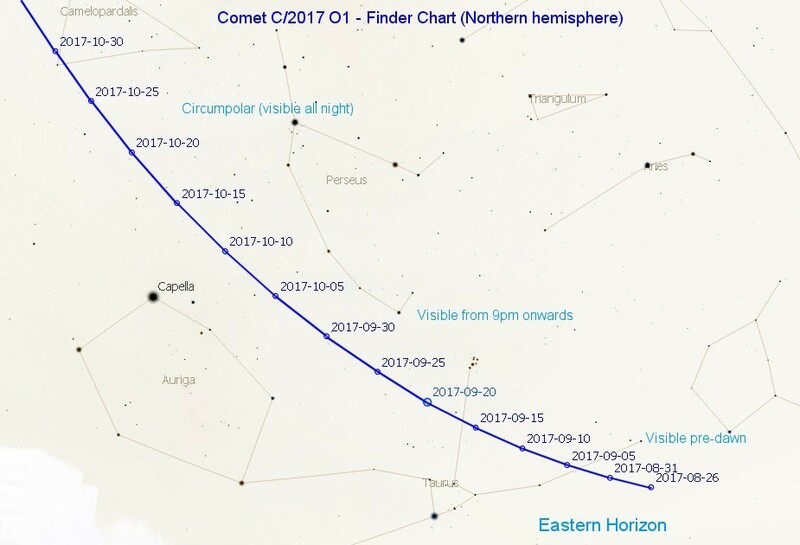 Discovered by the All-Sky Automated Survey for Supernovae (ASAS-SN) on 19th July, 2017, Comet C/2017 O1 was shining at magnitude 15 in Cetus. 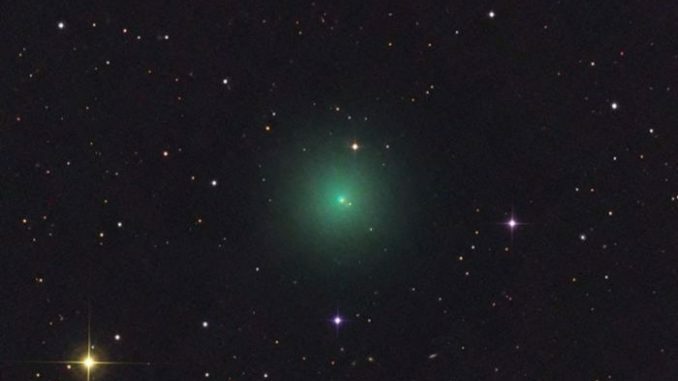 The comet has taken everyone by surprise when it brightened a staggering hundred times to magnitude +10. 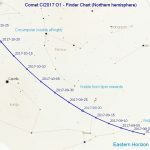 Now readily visible in backyard telescopes or decent sized binoculars from the southern hemisphere, the comet is expected to continue to brighten and move to the northern hemisphere in October. 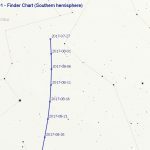 As the name might suggest, ASAS-SN is a survey for discovering supernovea, these surveys are prone to discovering other objects in the night sky. This is the first comet discovery by the survey. At the time of writing the comet resides in Eridanus and should then climb in to Taurus and Perseus in the coming months to greet northern hemisphere observers where it will then reside in a very favourable position for observation. The comet is expected to reach perihelion on 14th October at 1.5 AU from the Sun (just outside the orbit of Mars). will it be visible when it comes to the Northern Hemisphere? Yes, for the keen eyed, it’s moving north through Cetus as we speak. In August it should be visible from the northern hemisphere improving each day as it rises a few hours before sunrise fighting the twilight. 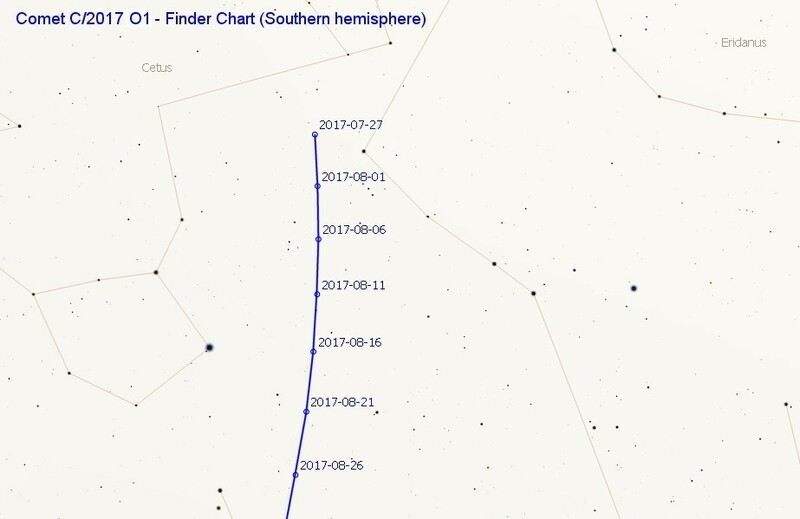 If you look at the finder charts above, the comet climbs higher each day eventually becoming circumpolar (visible all night) so September and October are more favourable times to observe it.